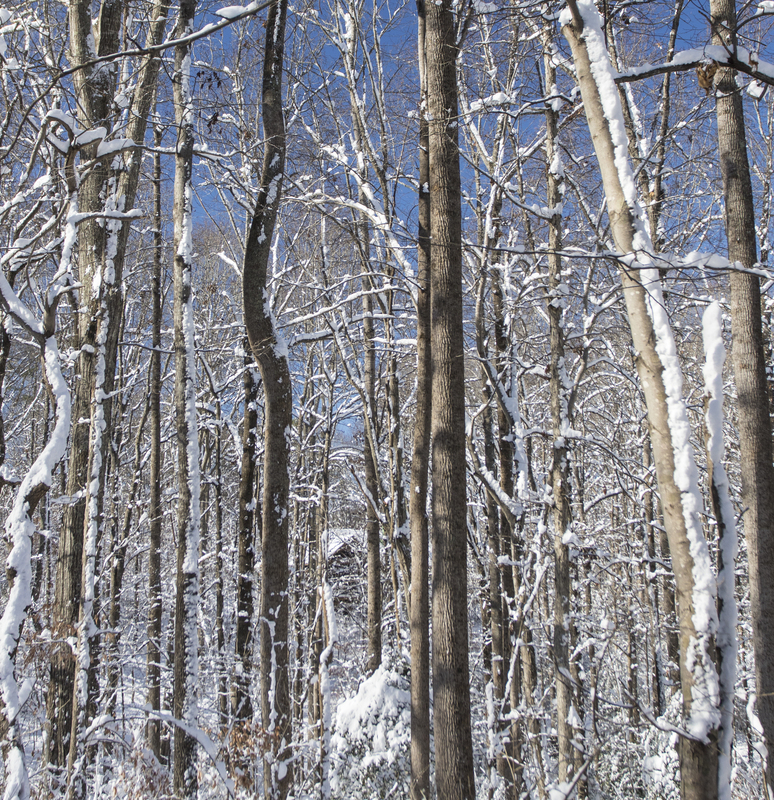 The quiet beauty of a winter snow storm…this is one of the true blessings of living in the woods (and of loving cold weather, since you don’t mind getting out in it…in fact, you can’t wait!). 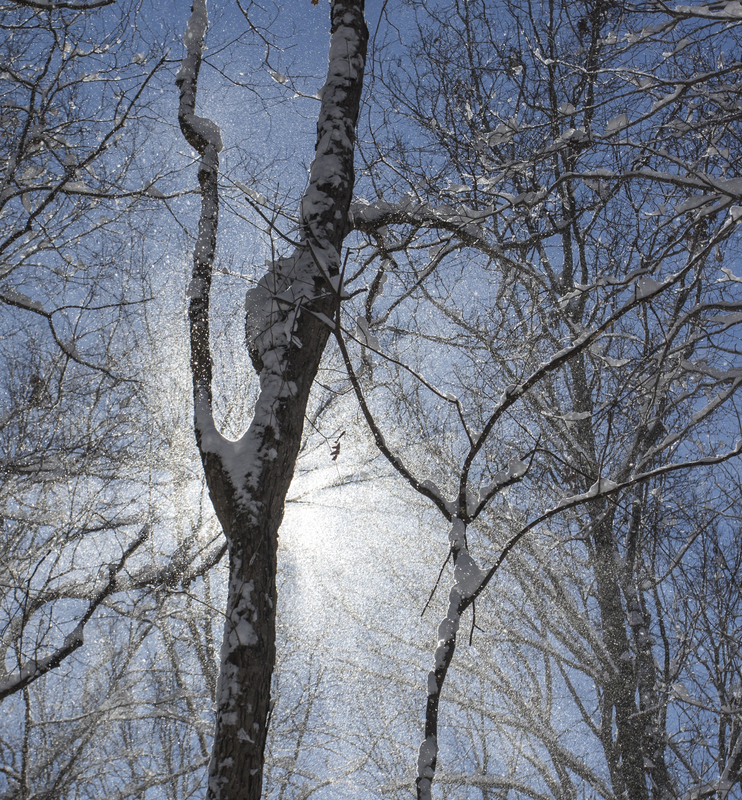 I love the winter quiet of a snow storm…and the simple beauty it imparts on everything it touches. 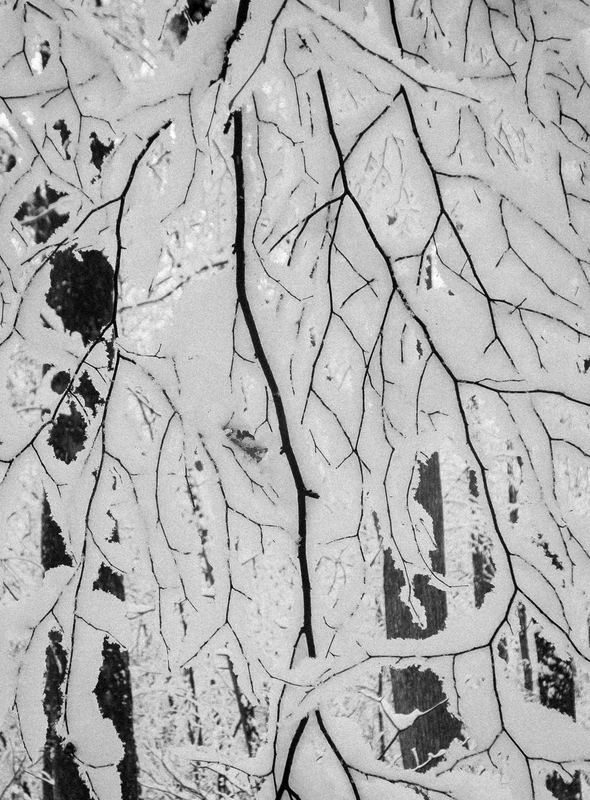 The patterns of branches, the trails of woodland creatures, the shapes of trees covered in white…all mesmerizing, magical. This snow lasted all day. Toward the end of the storm we went for a walk in the gray stillness of our woods, and felt lucky to live in such surroundings. 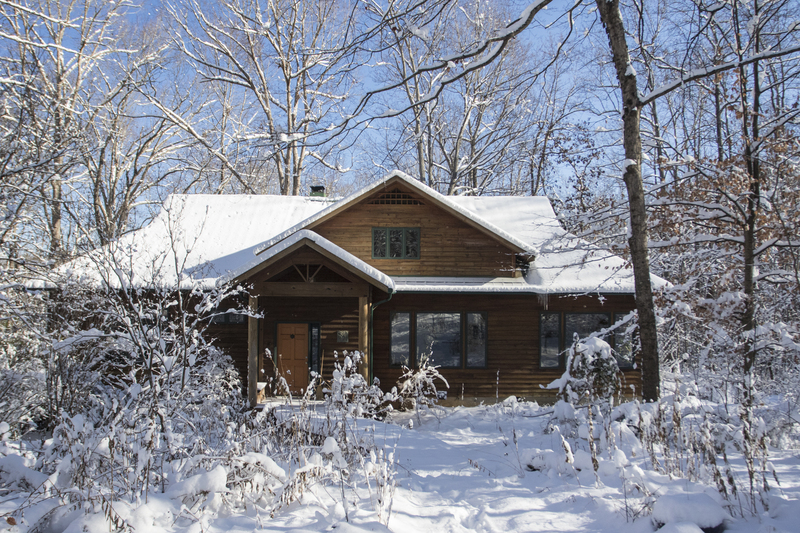 A brilliant blue sky greeted us the next morning, with a chilly 14 degrees on the thermometer. 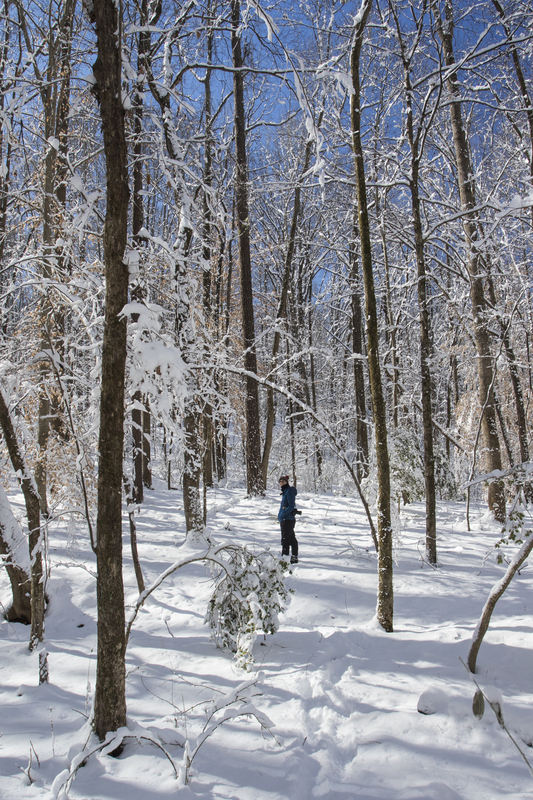 A walk in the woods seemed the thing to do (after filling the bird feeders, of course). 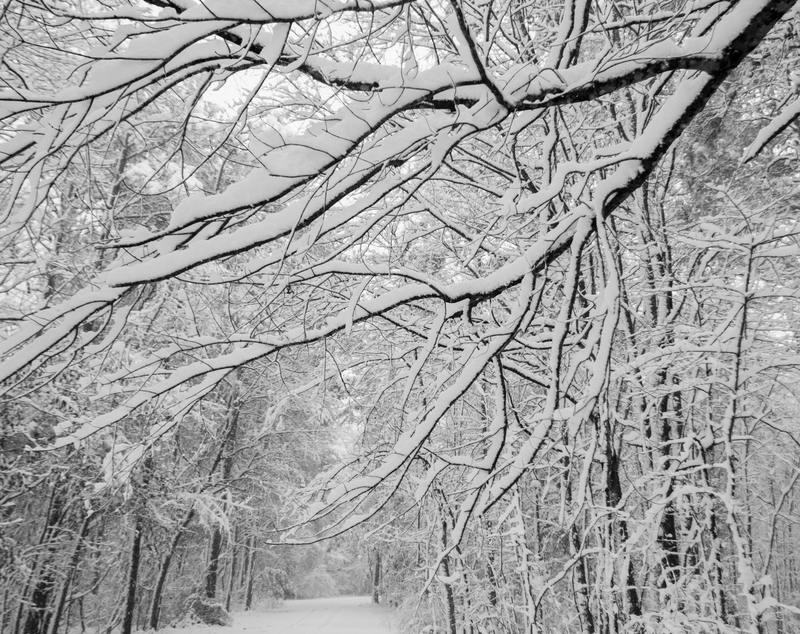 What had been a gray sky and a black and white landscape of patterns and shapes was now a glistening white, with the air full of tiny diamonds every time a breeze shook the snow-covered branches. We walked the property boundary, taking in the scenes of a forest transformed by a sculptor working with powdery white clay. 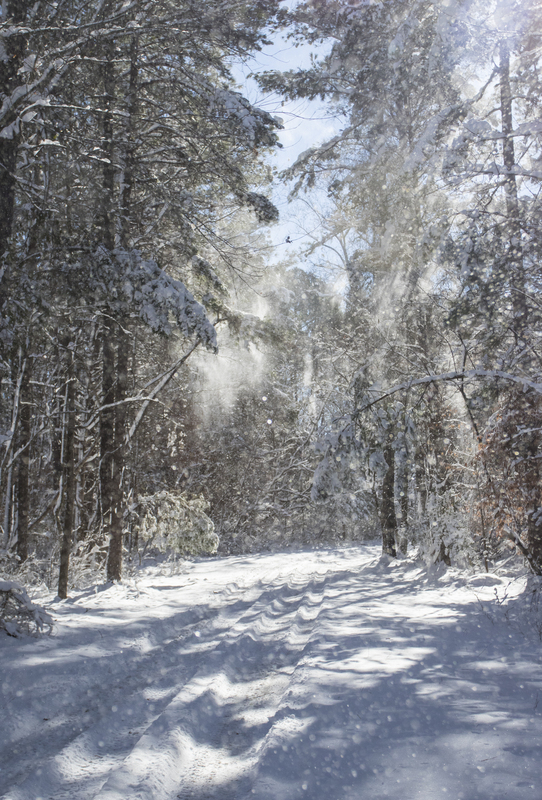 The wind started blowing and the tree branches began to shake their white blankets, releasing a snow burst of crystals that sparkled as they fell. We ended the day with a perhaps too late attempt at sledding the big hill just down the road. The sun was already melting the lone tire track down to gravel, making for a few scrapes down the hill. Not as fast as previous snows, but still not bad. This morning we went out and decided to make some wildlife in the yard. 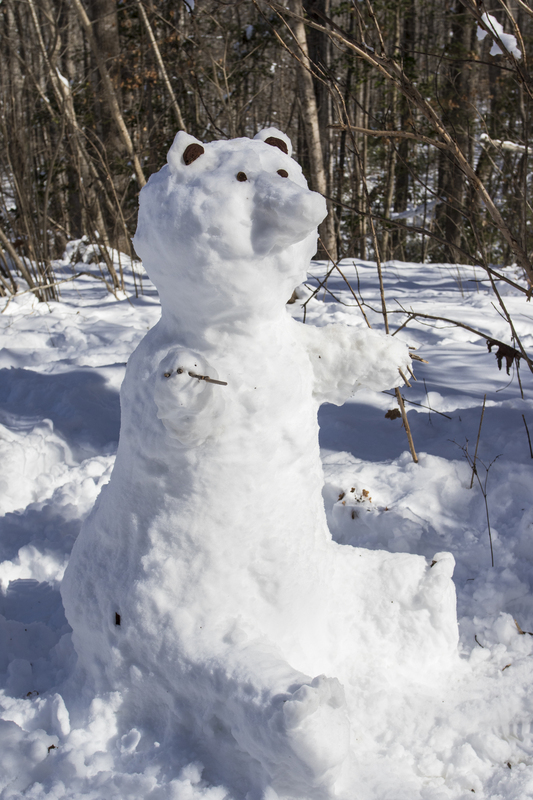 If only we had the time and could get to Pungo and see some real snow bears! The real wildlife, especially the birds, have been very active since the storm. A group of American crows stopped by this morning, no doubt looking for some of the scattered seed. They are wary, so when I walked by the window they all took off, including the one that was brave enough to land in the yard. We checked out the track trail and tried to decipher what had happened. Look at it and decide for yourself before reading further to see if you agree with our conclusion. I think the crow landed on the left side of the image, leaving a deep imprint of its body when it hit the snow (and a wing tip print on the far left). It then hopped up and turned to the right, leaving some wing tips seen at the top of the image. 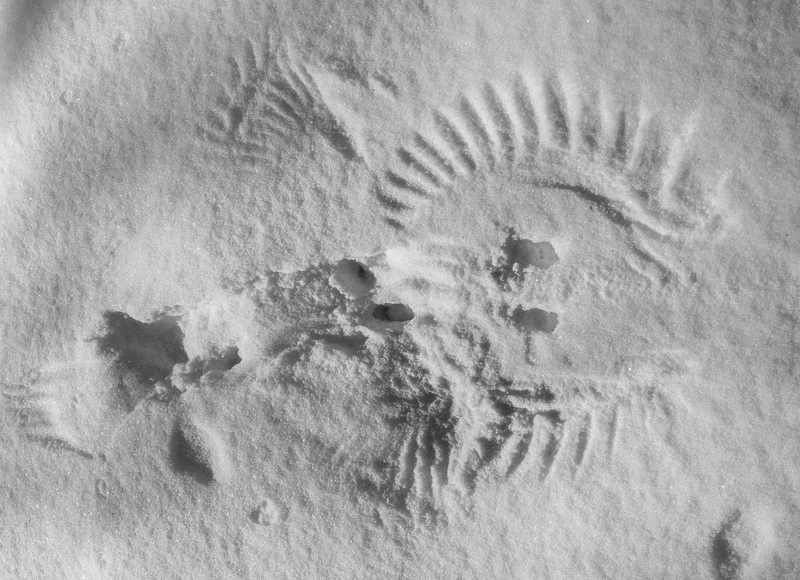 It took off from a position facing the right edge of the image, leaving two deep footprints and a sweep of its wings on both sides as it leapt off the snow. Let me know if you conclude something else. 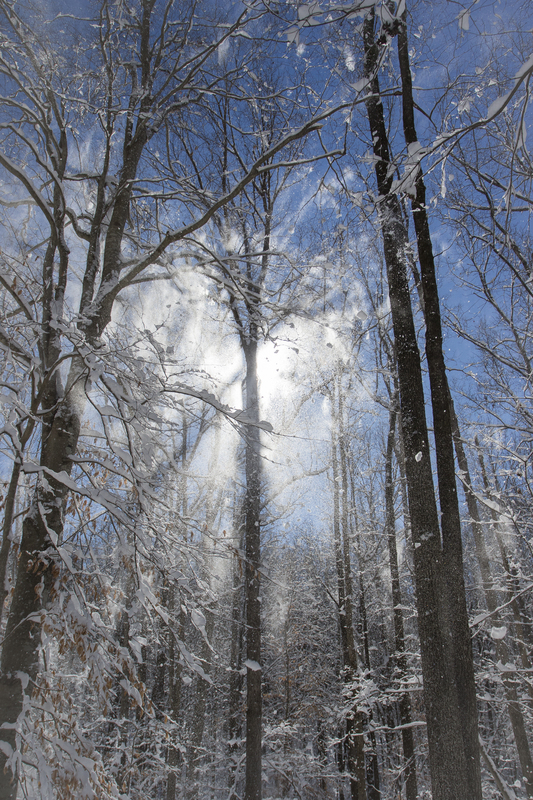 This entry was posted in Uncategorized and tagged snow by roadsendnaturalist. Bookmark the permalink. Thanks, Mary. 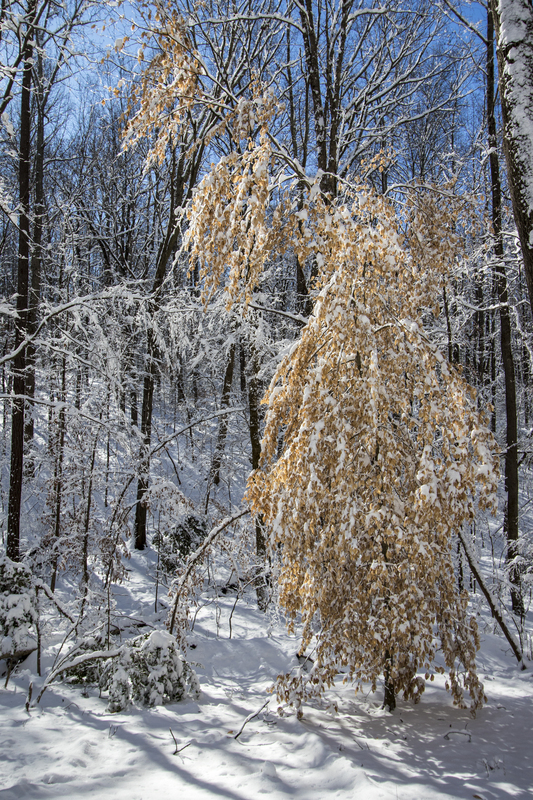 This has been a gorgeous snow! I sure is pretty, but I am glad it is there and not here. Thanks, it has been a beautiful snowfall.